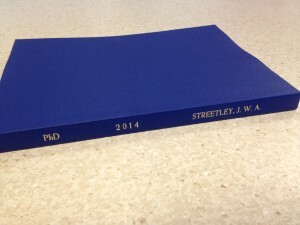 A few months ago, I submitted my PhD thesis. After all of the preparation and writing, submitting was somewhat of an anti-climax. This is because submitting those nicely bound volumes means nothing unless someone is going to read and examine them to determine if the work they contain will earn you the degree and the right to call yourself Dr. In the UK, these examinations often happen some time after submitting, in a process known as the viva. These exams involve the examiners coming to the university/institute and conducting a private, face-to-face examination of your knowledge and the work presented in the thesis, often over a number of hours. I had my PhD viva on Monday and I passed! I passed with the most common outcome; minor corrections. This means that whilst I have passed, the examiners would like some changes to be made before the final version of record is submitted. It is only when they are happy with those changes that I will officially earn the degree. For now, I’m beginning to come down from the celebrations and start working towards the corrections. So it is still not yet the end; I think the real closure will happen when the award letter and certificates are in my hands.